Lighting control at your fingertips! The Master controller EL1 and EL2 Gen 2 are our entry-level systems for centrally controlling large rooms with e-series fixtures. 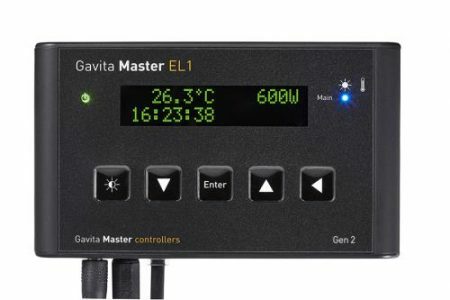 The second generation of Master controllers features improved and expanded functionality that raises the bar including non-volatile memory, event logging, independent sunrise and sunset settings and independent light cycles on the EL2. The EL1 has one lighting control channel and the EL2 has two lighting control channels. The EL1 can control 500 max repeater bus fixtures and 40 max single bus fixtures without a booster. The EL2 can control 1000 max repeater bus fixtures and 80 max single bus fixtures without a booster. 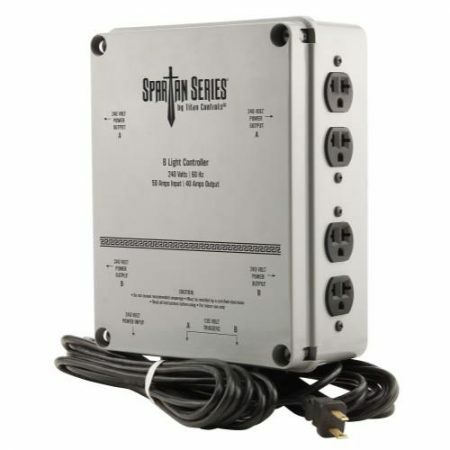 The 8 light controller operates up to 8000 Watts of grow lights in your garden. 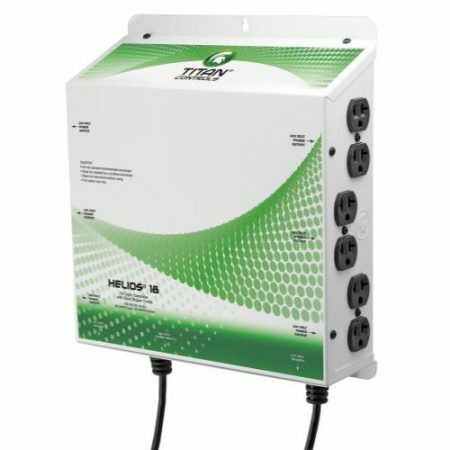 It features: heavy duty definite purpose contactors, dual trigger cord sets that give you the flexibility to stagger lighting schedules or delay starting times via an external wall timer and universal outlets that allow the use of 120 Volt or 240 Volt cord sets. The controller is housed in a rust, dust and moisture proof enclosure. 50 Amps input power/40 Amps output power/240 Volts/60 Hz./8000 Watts. This controller will run four (4) HID lights at 240 Volts. The only lighting controllers featuring industrial-grade ballast rated relays. Plug relay trigger cord into 24 hour wall timer to run your lights. Universal outlets allow total flexibility. Enclosure resists dust, rust and moisture. 30 Amps input power/20 Amps output power/240 Volts/60Hz./4000 Watts. This controller will run eight (8) HID lights at 240 Volts. The only lighting controllers featuring two (2) industrial-grade ballast rated relays. Plug dual relay trigger cord set into 24 hour wall timers to run your lights. Universal outlets allow total flexibility. Enclosure resists dust, rust and moisture. 50 Amps input power/40 Amps output power/240 Volts/60 Hz./8000 Watts. This controller will run sixteen (16) HID lights at 240 Volts. The only lighting controllers featuring industrial-grade ballast rated relays. 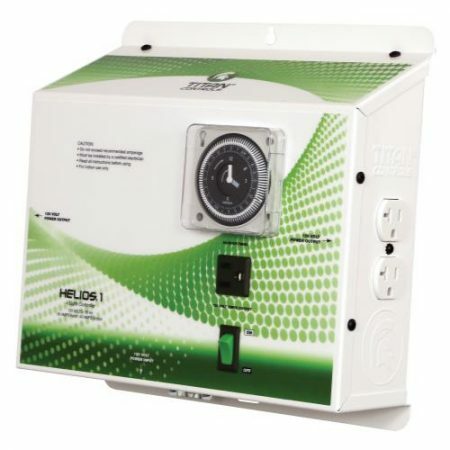 Premium quality timer with battery back-up keeps lighting schedule in the event of power failure (located on the bottom of unit). Sequenced lighting delays for each light bank. NEMA 6-15 UL Listed 240 VAC power outlets. 100 Amps input power/80 Amps output power/240 Volts/60 Hz./16,000 Watts. This controller will run twenty-four (24) HID lights at 240 Volts. The only lighting controllers featuring industrial-grade ballast rated relays. 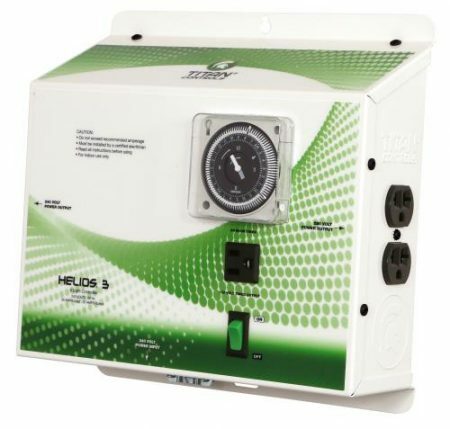 Premium quality timer with battery back-up — keeps lighting schedule in the event of power failure (located on the bottom of unit). Sequenced lighting delays for each light bank. 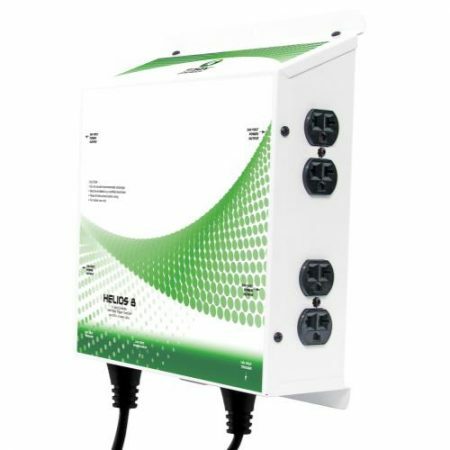 NEMA 6-15 UL Listed 240 VAC power outlets. 150 Amps input power/120 Amps output power/240 Volts/60 Hz./24,000 Watts. This controller will operate twenty-four (24) HID lights at 240 Volts. The only lighting controllers featuring industrial-grade ballast rated relays. Two (2) trigger cord sets activate lighting controller via external timers. Sequenced lighting delays for each light bank. All duplex outlets have circuit breaker protection. NEMA 6-15 UL Listed power outlets. 150 Amps input power/120 Amps output power/240 Volts/60 Hz./24,000 Watts. This controller will run twelve (12) HID lights at 240 Volts. 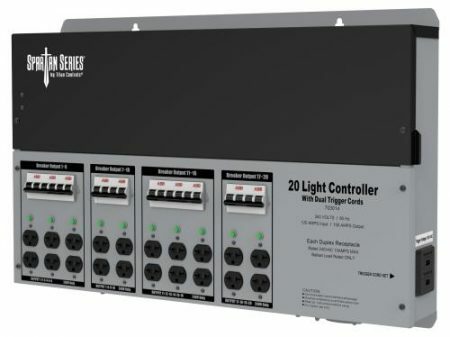 The only lighting controllers featuring industrial-grade ballast relays. Dual trigger cord sets allow the operator to run two separate light timing schedules. Removable front panel makes controller easy to wire into your power system. Universal outlets will accept either 120 or 240 Volt power cords. Durable 20 gauge powder-coated steel enclosure. 80 Amps input power/60 Amps output power/240 Volts/60 Hz./12,000 Watts. 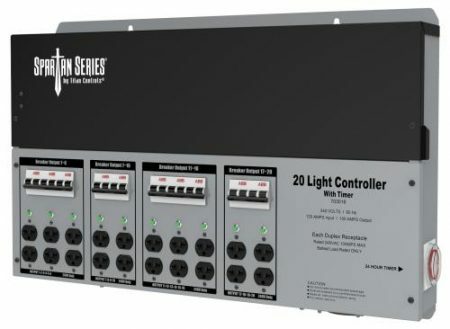 The Commercial Series 200 Amp Lighting Controller features: Allen-Bradley ballast rated industrial relays, Allen Bradley 30 Amp circuit breakers, dual trigger cord sets to activate lights, 0 – 30 second timing modules to delay HID bulb strikes. Comes with a three phase wiring configuration. 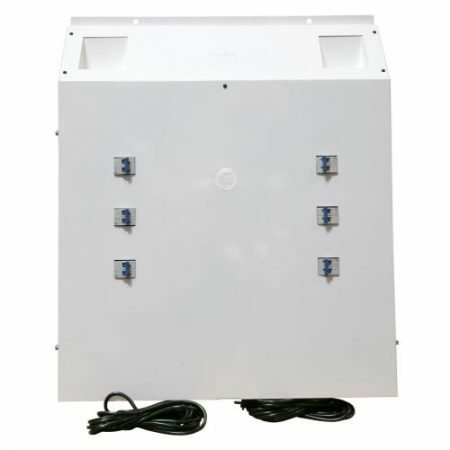 It features a 20 gauge powder-coated steel panel, convenient side wiring knock-outs, top power exit ports with knock-outs and manufactured in the USA. Commercial Series panels are built to be Titan tough! 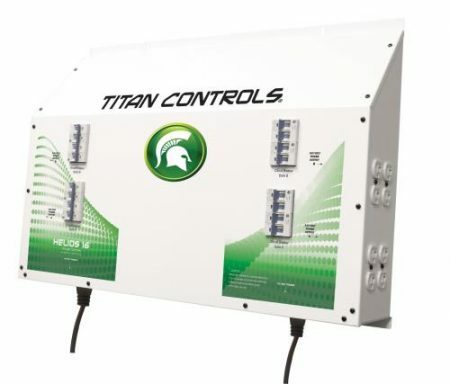 This controller will run four (4) HID lights at 240 Volts – maximum 4000 Watts. The only lighting controllers featuring industrial-grade ballast rated relays. 120 Volt accessory timed outlet to activate in-line fans to cool your lamps. 24 hour timer with 15 minute non-detachable setting tabs. Universal outlets allow total flexibility. Removable back panel makes controller easy to wire into your power system. On/Off switch that makes lamp replacement easy. Durable powder-coated steel enclosure. 30 Amps input power/20 Amps output power/240 Volts/60 Hz./4000 watts. Patent No. D660,252. 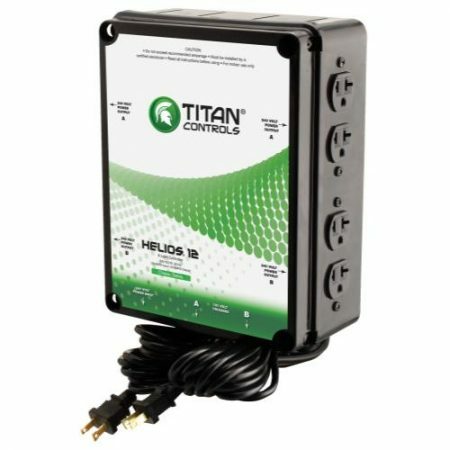 This controller will run four (4) HID lights at 240 Volts – maximum 4000 Watts. The only lighting controllers featuring industrial-grade ballast rated relays. 120 Volt accessory timed outlet (max 2 Amps) to activate in-line fans to cool your lamps. Plug relay trigger cord set into 24 hour wall timer. Universal outlets allow total flexibility. On/Off switch that makes lamp replacement easy. Removable back panel makes controller easy to wire into your power system. Durable powder-coated steel enclosure. 30 Amps input power/20 Amps output power/240 Volts/60 Hz./4000 watts. Patent No. D660,252. This controller will run four (4) HID lights at 240 Volts. The only lighting controllers featuring industrial-grade ballast rated relays. Plug relay trigger cord set into 24 hour wall timer. 120 Volt timed accessory outlet (max 2 Amps) for light mover or fan. Removable back panel makes controller easy to wire into your power system. Durable powder-coated steel enclosure. 30 Amps input power/20 Amps output power/240 Volts/60 Hz./4000 Watts. Patent No. D660,252. This controller will run eight (8) HID lights at 240 volts. The only lighting controllers featuring two (2) industrial-grade ballast rated relays. Plug relay trigger cord set into 24 hour wall timer. Removable front panel makes controller easy to wire into your power system. Durable powder-coated steel enclosure. 50 Amps input power/40 Amps output power/240 Volts/60 Hz./8000 Watts. Patent No. D660,252. This controller will run eight (8) HID lights at 240 Volts. The only lighting controllers featuring industrial-grade ballast rated relays. Easy to follow instructions & makes installation simple. Dual trigger cord sets allow the operator to run two separate light timing schedules. Removable front panel makes controller easy to wire into your power system. Universal outlets will accept 120 Volt or 240 Volt power cords. Durable 20 gauge powder-coated steel enclosure. 50 Amps input power/40 Amps output power/240 Volts/60 Hz./8000 Watts. Patent No. D660,252. The Medusa Series of digital flipping and lighting controllers solves the headaches traditionally associated with lighting flippers. 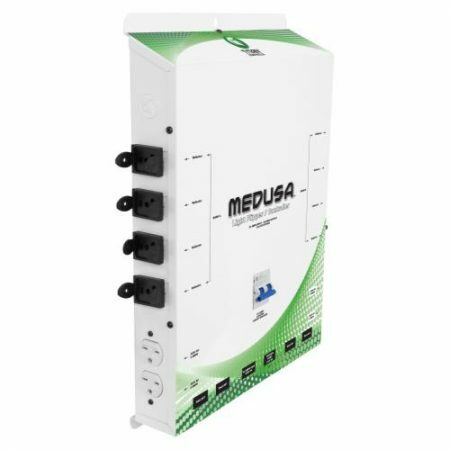 Not only does the Medusa Series flip lights, it’s also a lighting controller, essentially being two products in one. Your ballasts and reflectors all plug into one unit! The digitally based design of the controller allows for the Medusa to properly flip and control your lights. 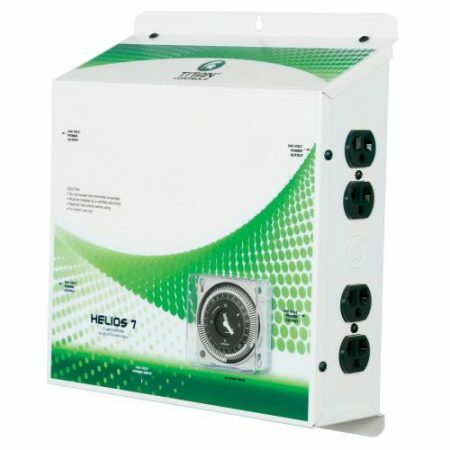 An easy to use trigger cord is plugged into the Apollo series timer (included) to control the switching between light banks. When powered ON, Medusa is powering bank A by default. Once the trigger cord has been activated according the user defined timing pattern, the digital part of the controller goes to work. 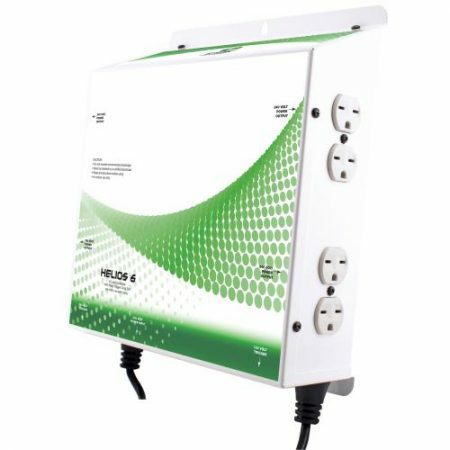 With precision timing, the Medusa will turn OFF power to the ballasts, switch the relays to bank B and then reapply power to the ballast, light bank B. 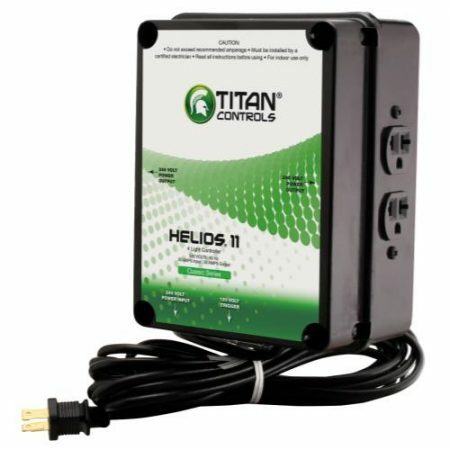 This controller also incorporates Titan Controls patent pending top off design for easy installation. Features a powder coated steel enclosure that is designed for the harsh gardening environment. 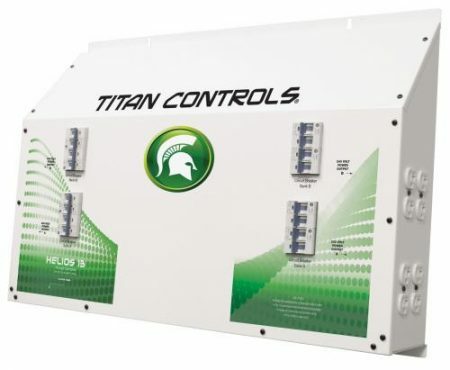 When ‘Failure is not an option”, use Titan Controls! 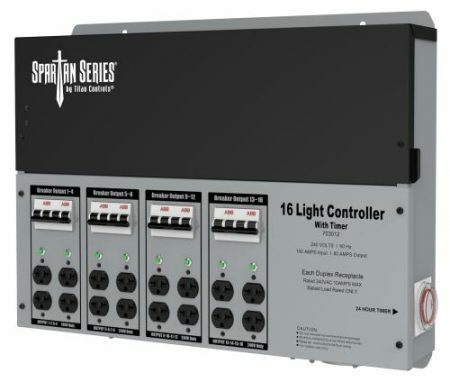 The Spartan Series Metal 16 Light 240V Controllers brings you quality and reliability for an economical cost. The heavy duty enclosure will stand up to the rigors of a growing environment while controlling your lights flawlessly. The controllers utilize a heavy duty definite purpose contactor that is rated for ballast usage. These controllers also have built in circuit breakers for added protection. 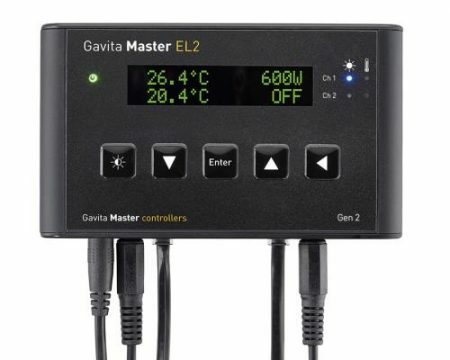 There are two options for activation, a built in timer for easy consolidated installation or dual trigger cords which are designed to be plugged into any 120V timer(s). 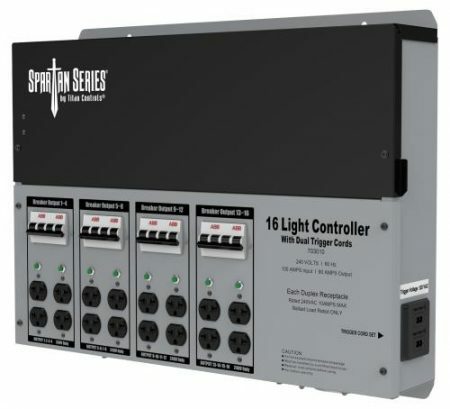 The dual trigger cords allow you either run all 16 lights at once or to split them and run two groups of 8 lights separately. 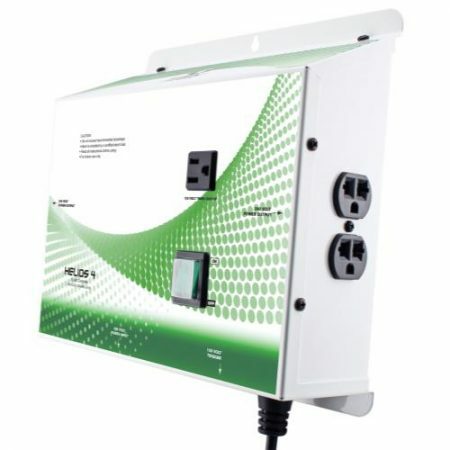 These products also feature universal outlets which allow you to use a 120V or 240V cord to run your ballasts at 240V. 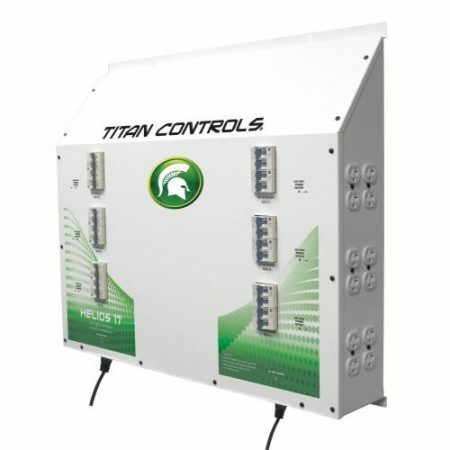 The Spartan Series Metal 20 Light 240V Controllers brings you quality and reliability for an economical cost. 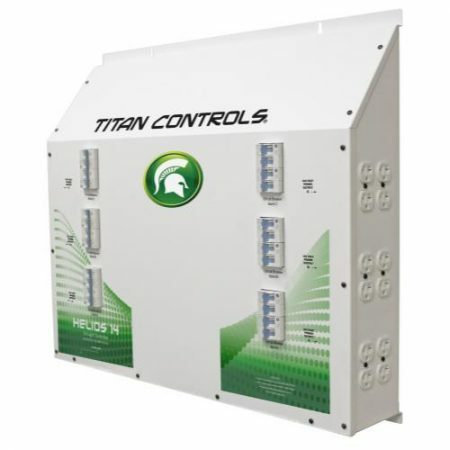 The heavy duty enclosure will stand up to the rigors of a growing environment while controlling your lights flawlessly. The controllers utilize a heavy duty definite purpose contactor that is rated for ballast usage. These controllers also have built in circuit breakers for added protection. 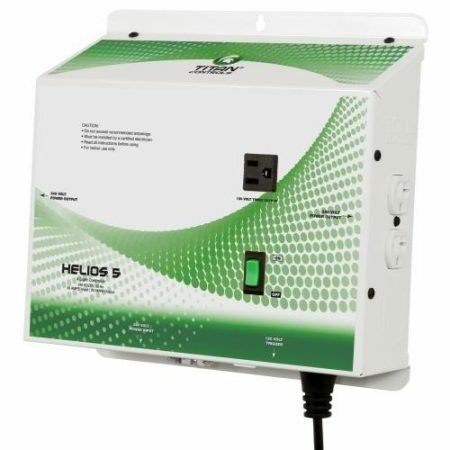 There are two options for activation, a built in timer for easy consolidated installation or dual trigger cords which are designed to be plugged into any 120V timer(s). The dual trigger cords allow you either run all 20 lights at once or to split them and run two groups of 10 lights separately. 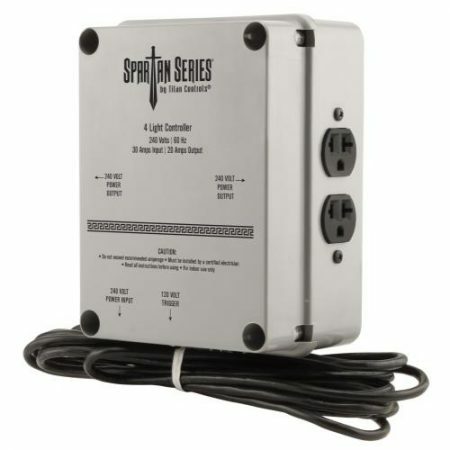 These products also feature universal outlets which allow you to use a 120V or 240V cord to run your ballasts at 240V.